To Cite: Nikpey A, Kazemian H, Safari-Varyani A, Rezaie M, Sirati-Sabet M. Protective Effect of Microporous Natural Clinoptilolite on Lead-Induced Learning and Memory Impairment in Rats, Health Scope. 2013 ; 2(1):52-57. doi: 10.17795/jhealthscope-10041. Background: Lead poisoning impairs memory and learning. Objectives: The protective effect of natural zeolite clinoptilolite on memory and learning impairment in rats exposed to lead acetate was investigated. Materials and Methods: 60 male Wistar rats in six groups treated for 2 months with diets contained different ratios of natural zeolite(i.e. 5% or 12.5%), and %0.2 lead acetate (LA) concentrations. behavioral test was evaluated by passive avoidance learning method in shuttle box at 6, 12, 24, 48 hours, and one week after the shock test. Results: digestive exposure with 0.2% lead acetate in the presence of zeolite additive had no effect on the rats’ memory performance (P < 0.05). Adding 5 and 12.5%w/w of natural zeolite to the rats’ feed improved short-term, medium-term, and long-term memory performance (P < 0.05) compared to the control group. Conclusion: observed improvement in memory function can be considered in part as the indirect effects of cation exchange or adsorption property of zeolites. Lead is one of the renowned toxic heavy metal cations which has widespread applications in industrial processes resulting high potential release into the workplaces and environment. Contamination of the workplace and indoor area with lead has long been recognized as a very serious health problem which has to be addressed very carefully (1, 2). Lead is present in tap water to some extent as a result of dissolution from natural sources, but primarily from household plumbing systems containing lead in pipes, solder, fittings, or the service connections to homes (3). According to the environmental quality standards, the maximum allowable concentration of Pb for drinking water is about 0.01 mg.L-1 (4). Lead has shown several adverse effects on the human body, particularly hematopoietic and the central nervous systems are the most important targets of Pb+2 mediated toxicity (2). Renal tumors have been induced in experimental animals exposed to high concentrations of lead compounds in the diet, and IARC has classified lead and inorganic lead compounds in Group 2B. However, there is evidence from studies in humans that adverse neurotoxic effects rather than cancer may occur at very low lead concentrations (3). Moreover, it has been the subject of many studies as a nervous poison agent which affects learning and memory (5-8). The application of the conventional chelators as pharmacological intervention in patients people with low levels of lead in their bloods has been somewhat prohibited by the reported adverse health effects of conventional chelators, and the uncertainty in their efficacy in reversing or preventing the toxic effects of lead (10). Several studies have been performed to determine the function of nutritional factors such as some essential elements, vitamins, and antioxidants in preventing lead toxicity. In this way, the effect of competitive nutritional and antioxidant factor versus lead cation prevents absorption of lead and lead – induced oxidative stress in body (11-13). Natural zeolites are hydrated crystalline materials with a three dimensional structure consists of hydrated aluminosilicates of group I and group II metals. In structural viewpoint, zeolites are framework aluminosilicates which are based on an infinitely extending three-dimensional network of AlO4 and SiO4 tetrahedral linked to each other oxygen bridges. Framework of the zeolitic materials contains of channels and interconnected cavities which are occupied by the mobile cation and water molecules. The nonframework cations such as Natrium, Calcium, Titanium, Cobalt, Magnesium, Aluminum, and Zinc are quite mobile which easily exchange to varying degrees by other cations in the surrounding environment (14, 15). Zeolite structure has a negative charge, and thus can adsorb cations in micro pores channels and cavities via an ion exchange mechanism. Mercury, lead and cadmium are well known as typical toxic heavy metal cations, which can be easily captured into the pores of zeolitic materials by exchanging with extra framework cations such as sodium (15-17). High surface area, porous structure, selective absorption, and the possibility to change surface characteristics of zeolites make them a potential multifunctional adsorbents suitable for adsorption of mycotoxins mycoxyanions (18-21) and as a carrier for the controlled and slow release of some drugs (22-24). hundreds of patients had undergone clinical trials and treated with between 2 - 6 tablets, each tablet contained 900 mg clinoptilolite at the rate of 2 tablets every 4 hours with no adverse effects (25). However, in Bulgaria, pills and biscuits were prepared for human consumption to adsorb heavy metal radioisotopes consumed with contaminated food after the Chernobyl disaster (26). However, after the Chernobyl disaster in order to adsorb radioisotopes in peoples who intake heavy metal , tablets and breads containing natural zeolite was used for human consumption (26). There are plenty of evidences showing beneficial effects of natural zeolite including clinoptilolite when they used as additive in animal diets. Studies have shown that using 0%, 3%, 5%, and 10% clinoptilolite as a feed supplement to the diets of swine, Leghorn, broiler chickens, chickens poultry, ruminants, and other animals results in improved milk yields, weight gain, and feed conversion ratios (27). Adsorption and ion exchange properties of natural zeolite represented the hypothesis of a possible easing of the biological uptake of lead and its subsequent effects on living organism. Evidence supporting this hypothesis was a significant reduction of lead concentration in kidney and liver of growing pigs, in which 1% natural clinoptilolite was added to their contaminated diet with 500 or 1000ppm lead (28, 29). Following our previous research on adsorption of lead in natural zeolites (15, 17), this study was therefore conducted to determine whether intake of this compound possesses protective effects on the learning and memory deficiency induced by lead exposure in rats. Natural zeolite used in this research was a clinoptilolite-rich tuff from Semnan region, Iran. Zeolitic rock was pulverized and sieved to give a particle size smaller than 600μm. The powdered sample was then washed with distilled water to remove all the soluble impurities, and then dried at 323 K overnight, and its chemical composition was determined by means of XRF technique (17). The experiments were performed on 60 male Wistar rats weighing 85 ± 10.3 g. In total, 60 rats were randomly divided into six groups of 10, and treated for 2 months with diets contained different ratios of natural zeolite (clinoptilolite), and lead acetate (LA) concentrations. The animals were housed in polycarbonate cages in the animal house, with 12-h dark–light cycles, at a temperature of 20–25°C, and relative humidity of 30–50% (9). All animal experiments were performed in accordance with the European Communities Council directive of 24 November 1986 (86/906/ BCE) in such a way to minimize the number of animals and their suffering. The first group (i.e. control I: no Pb exposure) was fed with normal diet and treated with distilled water. The second and third groups were fed with a diet contained 5% and 12.5% of natural zeolite powder respectively. The rats in the fourth group (i.e. control II: Pb exposure) were fed with normal food and distilled water containing 0.2% of LA (9). The fifth group were fed with a diet contained 12.5% of natural zeolite and treated with distilled water containing 0.2% of (LA); finally, the sixth group were fed with a diet contained 5% powdered natural zeolite, and treated with distilled water containing 0.2% of (LA). To prepare the diet food, appropriate amounts of natural zeolite powder (i.e. 5% or 12.5%) was mixed with wheat flour and distilled water. Moreover, the clinoptilolite has extremely low water content, effectively inhibiting the growth of typical food-borne microbes but it was sterilized in autoclave at 110°C prior to use. Lead acetate (LA) was used as a source of Pb2+ ion in the rats’ diet, and was obtained from MERCK Company. 0.2 percent of LA solution on the basis of average weight of rats was prepared by adding required amounts of lead acetate to distilled water . To prevent lead acetate precipitation and to improve the taste, one litter of the lead acetate solution was acidified by adding 1 ml of glacial acetic acid (9). The passive avoidance learning was evaluated by using a light-dark box consisting of a 70 × 43 × 38 cm polycarbonate apparatus. After 60 days, all groups of rats were subjected to behavioral test using passive avoidance learning methods in shuttle box. The device has two containers of light and dark with the dimensions of 70 × 43 × 38 cm consisted of a metal mesh floor, which was separated by a guillotine door with dimensions of 8 × 8 cm. To run the behavioral tests, animals were placed in the light part of device. After 5 seconds guillotine door was opened slowly and the animals were entered into the dark part of the machine. Then the guillotine door was closed and the animals were taken out from the dark part. In the next step, 30 minutes later the animals were placed into the light part of the device. After 5 seconds the guillotine door was opened. When the animal was entered into the dark compartment the guillotine door was closed. Then a constant-voltage electric foot shock (AC, 60V, 1 mA current at 50 Hz) was given to the rat for 3 seconds in the dark compartment at the beginning of experiment. To ensure the acquisition of passive avoidance learning in two minutes after first learning, the behavior of rats was tested as before. No entry to the dark compartment for 120 seconds was considered as positive learning. 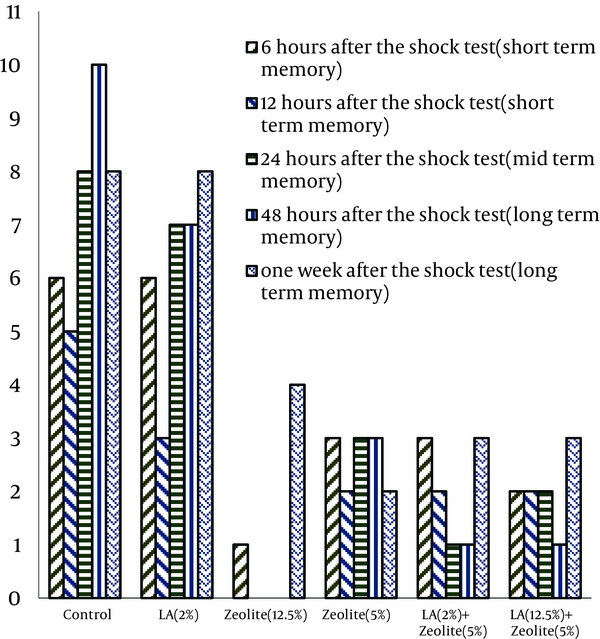 To determine the short-term, mid-term, and long-term memories of studied animals, the passive avoidance learning test was used at 6, 12, 24, 48 hours, and one week after the shock test. To do this, animals were placed in the light part of the device, after 20 seconds guillotine door between the two chambers was opened, and the time required for animals to enter into the dark part was recorded as a Step Trough Latency (STL). Statistical evaluation of results were performed by means of the two-way ANOVA and comparing mean levels of learning in different groups were performed by the Tukey test using SPSS software version 17. Statistical significance was accepted at P ≤ 0.05. The experimental protocol was approved by the review committee for animal experimentation of the Medical Faculty of the University of Qazvin. Chemical composition of the natural zeolite sample which was determined by means of x-ray florescence technique (XRF; Philips PW 1480) is summarized in Table 1. The Si/Al atomic ratio of the tested sample was 4.73. 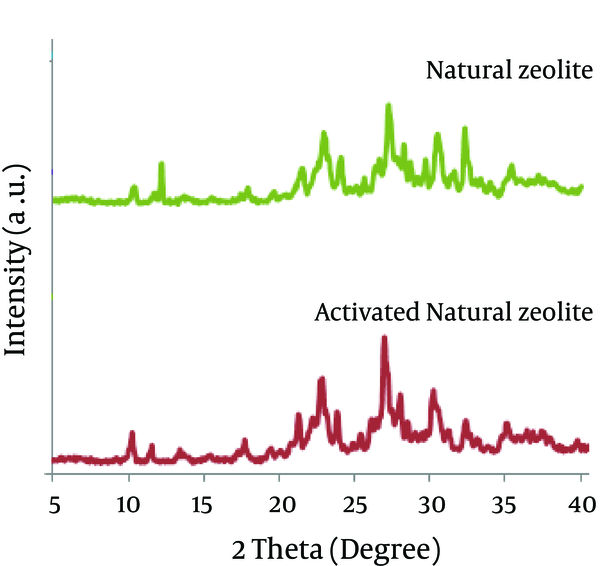 This data along with the data deduced from the XRD patterns illustrated in Figure 1 were shown that the examined sample is a natural clinoptilolite type zeolite which was rich in calcium. For mineral identification of the zeolite sample, x-ray pattern of the original sample and activated sample were determined using a Shimadzu x-ray diffractometer (XRD, model: XD-5A, Cu Kα radiation). Having the similar XRD pattern of the samples, it can be ascertained that the utilized mineral is a clinoptilolite zeolite which retained its crystalline structure after heat treatment meaning that the used mineral sample as lead adsorbent is thermally stable at the applied sterilized temperature. The effects of natural clinoptilolite on learning behavior of the 6 groups of studied rats after two months of feeding with different dosage of zeolite and lead acetate are summarized in Figure 2. The memory status of each group of rats in comparison to the control group (i.e. which used normal food and distillated water) in a confidence level of 95% (P < 0.05) is summarized in Table 2. There was no significant difference (P < 0.05) in memory strength in groups treated with water containing 0.2% LA compared to the control group. According to the results of the present research, oral intake of 5% and 12.5% of natural zeolite with food improves the memory performance of the tested rats. This positive effect of zeolite was enhanced with increasing zeolite dosage from 5% to 12.5%. Feeding the rats with diet contained 12.5% of zeolite showed significant improvement (P < 0.05) on the short and midterm memories of the studied animals, however, diet with 5% of natural zeolite showed greater influence on the longer term memory of the tested rats. The comparison of memory performance in the groups treated by 5% and 12.5% of zeolite and distilled water containing 0.2% lead acetate with the control group showed improvement in the mid and long term memory performance. Meanwhile, there was a significant improvement (P < 0.05) in memory performance between the groups treated with the mixture of lead and zeolite compared to the group treated with lead. According to the literature in the HUE group of natural zeolites (e. g., heulandite and clinoptilolite), samples with Si/Al ratios higher than four belongs to the clinoptilolite type and those with lower ratios (Si/Al < 4) are heulandite type (15). According to the published literature and based on extensive research that has been performed in this area, very divers results have been seen on the effects of lead on learning. Dragann et al. did not see significant difference in learning and memory between test and control groups in the lead doses that decreased motor activity by using shuttle box, Water - maze and T-maze (30). Ma et al. reported that lead has no effect on learning by radial maze method, while reduction of learning in rats by the active conditioned method has been reported by other researchers (31). Hoshmand et al., have reported that lead dosage, with an exception of 0.1%, had no significant effects on brain wave pattern, memory and behavior of tested rats (9). The results of current study confirms that using 5% and 12.5% concentrations of clinoptilolite in the food improved memory function in rats, and increased percentage of zeolite in food substantially improved short-term, mid-term, and long-term memory performance. However, no significant improvement in short-term memory by 5% concentrations zeolite was observed compared to the control group. Effects of combined lead and zeolite treatment had similar results, and there was a significant association in memory performance (P < 0.05) compared to the control group, and the group that only used lead. a) It seems that the high affinity of clinoptilolite for lead would significantly reduce the amount of dietary lead available for absorption by the body. It has been demonstrated that clinoptilolite binds the essential micronutrients copper, zinc, cobalt, and manganese to only a very limited extent, and does not adsorb either of the amino acids nor any of the fat-soluble vitamins studied (33, 34), and no significant alterations in the serum concentrations of vitamins A and E, and inorganic phosphorus, potassium, copper and zinc (27). b) On the other hand it seems that considerable amount of various key mineral elements such as calcium, titanium, cobalt, magnesium, aluminum, and especially zinc can be potentially extractable from clinoptilolite in the acidic condition of stomach gastric fluid which can lead to positive changes on memory performance (35). Zeolite can absorb small amounts of substances with low molecular weight such as glucose and amino acids that are produced during the digestion process or ammonia converting by intestinal bacteria. Hydrophilic properties of zeolite raises the hypothesis that the zeolite was hydrated in the gastrointestinal tract and causes adsorption of water soluble substances with low molecular weight like ammonia. c) In physiological conditions it is possible that the silicate anion releases from the zeolite structure. This possibility would increase by increasing the partial solubility of zeolite in acidic condition, and causes systemic changes in electrolyte transport and in liver and kidney function (35). However, more detailed investigation on different aspects of the cation exchange and adsorption properties of natural zeolites in gastrointestinal is needed to understand the mechanism in which it affects the memory functions of animal. In this regards, different dosages of lead and zeolite and other adsorbent materials such as activated carbon can be applied for longer time period, and also other biochemical parameters should be monitored simultaneously. This research was supported by financial aid from Qazvin Medical Science University, Qazvin, Iran. The authors would like to gratefully thank the Vice President of the Research Department of Qazvin Medical Science University for their Contribution to this research. Implication for health policy/practice/research/medical education The study discusses the protective effects of natural zeolites on the health effects of heavy metals such as lead. Reading this article recommended to the specialists in the field of toxicology, biochemistry, occupational medicine, occupational and environmental health. Please cite this paper as Nikpey A, Kazemian H, Safari-Varyani A, Rezaie M, Sirati-Sabet M. Protective Effect of Microporous Natural Clinoptilolite on Lead-Induced Learning and Memory Impairment in Rats. Health Scope. 2013; 2(1): 52-7. Authors’ Contribution Ahmad Nikpey: Participated in all parts of experiment, Hossein Kazemian: Desinged and conducted the project, Ali Safari-Varyani: Consult and co desineger of the project, Marjan Rezaie: Participated in experimental methods, Majid Sirati-Sabet: Consult and co desineger of the project.